Blog hopping this a.m. and came across this painting - it's so awesome how God puts things right in front of you with His perfect timing -we were just discussing 'thankfulness' last nite in our small group and the importance of giving God thanks at all times -for everything!!!! I love this scripture and have now added it as my wallpaper on my computer- as a gentle reminder that I'll see each time I sit down to the computer (which is alot!). love the picture - i'd love it hanging in my house! :) How's your small group working out? Sounds like it's a home group? Very cool - can't wait to catch up soon! It's going to look great in your house! God is good! Cute kids and sweet blog! 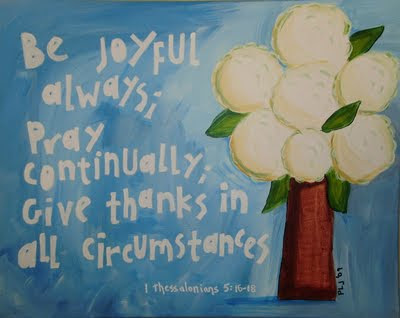 Glad this painting is going to a Christ-filled home! I mentioned in my email that the Bible is perfect. I forgot to mention that God is also perfect. Making Each Place, Each Day, Each Fleeting Moment.....A Masterpiece! His soccer guys! - Somebody is diggin' the World Cup action! Checked off my list- finally! The verdict: Carter can hear you! Devoted wife to Mark - celebrating 8 years of marriage. Proud mommy to Anderson (5 years old) & Carter (2yrs+)! Just moved back to Hotlanta after living in Va Beach for 5 years. Hard to 'start-over', but know the Lord will bless our move back towards family. As of December 2008 I am now a SAHM - after working in corporate America for 10 years. I'm looking forward to this time with my boys!